“I am not afraid to die, I am afraid to lose the battle” – Mohammed Nabbous, Benghazi martyr today. Omar Al-Mukhtar would be proud. @ChangeinLibya. Mohammed Nabbous – known as Mo to the world – has been with the Libyan revolution from the beginning. 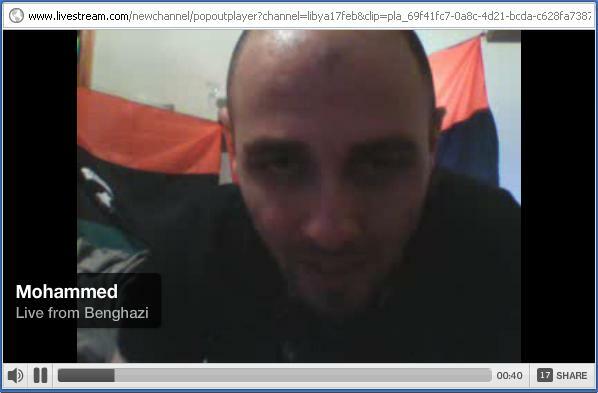 I tuned into his Livestream Libya Alhurra broadcast from the first night on Feb 19, exactly one month ago. Equipped with his laptop, he started broadcasting in the midst of the Benghazi uprising. He moved every couple of hours to avoid detection and capture. note: Al Hurra is freedom in Arabic. His TV station has grown over the weeks from a couple of guys speaking Arabic to English transmissions and/or Arabic transmissions translated in chat. He attracted a world-wide audience in his chat room with comments in English, Arabic, German, French and Spanish. This is the photo of him broadcasting before he left his home and his wife to go out and report the bombing in Benghazi. He is missing. No one knows if he has been injured or worse.Â Â THEN He has been in contact with his wife. He’s fine! Thank God! AND FINALLY, He is gone. A martyr on March 19 2010 to the cause of Free Libya. Victim of sniper fire. Mo’s wife: “Please pray for him. @iyad_elbaghdadiÂ I remember crying with Wael Ghoneim when he was released in#Egypt. At least Wael lived. God chose Mo for something else. #MoNabbos we will never forget you. To paradise my friend.Â #LibyaÂ united and free. @ChangeinLibya.”I am not afraid to die, I am afraid to lose the battle” – Mohammed Nabbous, Benghazi martyr today. Omar Al-Mukhtar would be proud. I feel like I know knew him even though I’ve only watched and listened to him grow. CNN was interviewing him earlier. ABC mentioned him. He was a man with a mission and a man who will make helped make a mark in the new Free Libya possible. Inshallah. He’s dead, shot by a sniper in Benghazi:( RIP May God Bless Upon His Soul!